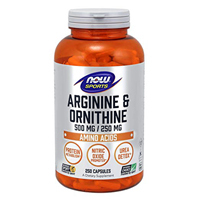 Arginine is necessary for urea metabolism, a process that prepares toxic ammonia for safe excretion by the kidneys. Ornithine is synthesized from Arginine and is a precursor of citrulline, proline and glutamic acid. * Both of these amino acids are popular with athletes and other active individuals. 두 아미노산 은 운동에 의한 근육증강 및 체지방 연소로 체중감소 에 많이 이용됩니다. As a dietary supplement, take 2 capsules 2 to 3 times daily, preferably with juice or water on an empty stomach, before exercise or at bedtime. This information current as of 6/9/12 2:24 PM.